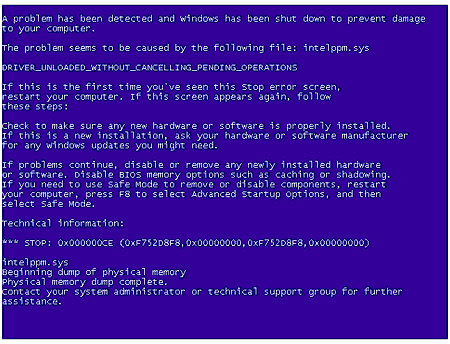 After updating VirtualBox from 2.2.4 (OSE) to full VirtualBox 3.0.2 I saw constant BSOD on guest Windows XP machine. After googling for misbehaving intelppm.sys that was causing the BSOD I found this VirtualBox ticket #420 with this issue. It seams that on Centrino hardware during the update of VirtualBox the Guest os now sees different CPU, and after the new CPU is installed intelppm.sys driver causes BSOD. after changing the 'Start' value to '4' and rebooting everything works ok. Thanks to Virtual PC Guy for his great blog entry regarding this issue.